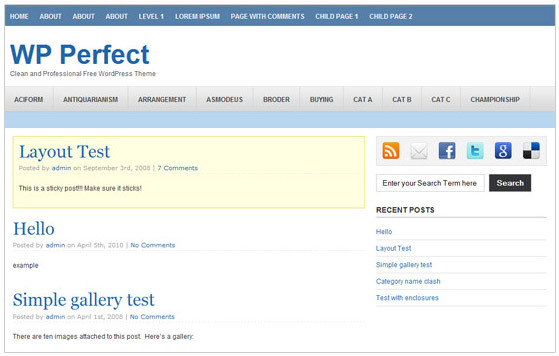 Thesis Perfect is a free skin for Thesis WordPress theme. The design and look of this skin is exact clone of my recently released WP Perfect WordPress theme. I received great response from the users of WP Perfect so I converted this theme into thesis skin so that the Thesis users can also use the same theme on their blogs. Download the Thesis Perfect skin files. Upload the custom.css, custom_functions.php and images to your Thesis custom folder. Now go to Thesis -> Manage Options and browse All Options file from the downloaded skin files. This is my first free thesis skin that I’m releasing on my blog. I would like to hear about this skin from you. If you want any new feature or want any improvement in this skin, just leave your comment here or get in touch with me on twitter or facebook. If you like this skin then click on the Retweet or Facebook share button below post title and help me spread the word. If you really like this skin then I would appreciate if you can write a review about it on your blog with a linkback to this post. How do you like the skin and what new features do you want in the next version of this skin. If you are using it on your blog, just drop a comment with your blog URL to let other know about it. If I get a chance then I’ll surely start a giveaway of Thesis theme here. Till then you can enjoy this beautiful minimal skin for free. awesome theme as the it’s name……. so, here i can use thesis in blog with the perfect theme…. Love the theme, I might use it soon. Thank you! thesis is the most customizable theme i have ever come across in all the themes i have ever found for blogs it is surely the best.nice share!! Good one for Thesis users. Thanks for appreciating my work Amandeep. Hi Thanks for this skin bro. I will surely, write a review of this in my website. This is a great Thesis skin! I’ve been looking for something that would work well for sites that I lease to small biz owners. I think this might work well. This Thesis Skin is perfect and yes, it is absolutely free. Thanks for all the hardwork you have put in and your generosity in sharing it with us. Good Thesis skin. Great for These users. I have updated the download link. All the data was lost when my blog got hacked. You can download the skin now. Good joob Simrandeep 🙂 Hope to see more cool thesis skin from u. Thanks for presenting us such a nice collection of thesis skins.. I want to use it on Blogger , can i do so ? I just love your design and want to sue on blogger , can you tell me if it’s possible ?